Political life in Italy was not so much tranquillized as stunned by the massacres and confiscations of Marius and Sulla. The scale upon which this history is planned will not permit us to tell here of the great adventurers who, relying more and more on the support of the legions, presently began to scheme and intrigue again for dictatorial power in Rome. In 73 B.C. all Italy was terrified by a rising of the slaves, and particularly of the gladiators, led by a gladiator from Thessaly, Spartacus. He and seventy others had fled out from a gladiatorial «farm» at Capua. Similar risings had already occurred in Sicily. The forces under Spartacus necessarily became a miscellaneous band drawn from east and west, without any common idea except the idea of dispersing and getting home; nevertheless, he held out in southern Italy for two years, using the then apparently extinct crater of Vesuvius for a time as a natural fortress. The Italians, for all their love of gladiatorial display, failed to appreciate this conversion of the whole country into an arena, this bringing of the gladiatorial sword to the door, and when at last Spartacus was overthrown, their terror changed to frantic cruelty, six thousand of his captured followers were crucified–long miles of nailed and drooping victims–along the Appian Way. Here we cannot deal at any length with Lucullus, who invaded Pontus and fought Mithridates, and brought the cultivated cherry-tree to Europe; nor can we tell how ingeniously Pompey the Great stole the triumph and most of the prestige Lucullus had won in Armenia beyond Pontus. Lucullus, like Sulla, retired into an opulent private life, but with more elegance and with a more gracious end. We cannot relate in any detail how Julius Caesar accumulated reputation in the west, by conquering Gaul, defeating the German tribes upon the Rhine, and pushing a punitive raid across the Straits of Dover into Britain. More and more important grow the legions; less and less significant are the Senate and the assemblies of Rome. But there is a certain grim humour about the story of Crassus that we cannot altogether neglect. This Crassus was a great money-lender and forestaller. He was a typical man of the new Equestrian type, the social equivalent of a modern munition profiteer. He first grew rich by buying up the property of those proscribed by Sulla. His earliest exploits in the field were against Spartacus, whom finally he crushed by great payments and exertions after a prolonged and expensive campaign. He then, as the outcome of complicated bargains, secured the command in the east and prepared to emulate the glories of Lucullus, who had pushed east from Pergamum and Bithynia into Pontus, and of Pompey, who had completed the looting of Armenia. His experiences serve to demonstrate the gross ignorance with which the Romans were conducting their affairs at that time. He crossed the Euphrates, expecting to find in Persia another Hellenized kingdom like Pontus. But, as we have already intimated, the great reservoirs of nomadic peoples that stretched round from the Danube across Russia into Central Asia, had been raining back into the lands between the Caspian Sea and the Indus that Alexander had conquered for Hellenism. Crassus found himself against the «Scythian» again; against mobile tribes of horsemen led by a monarch in Median costume. The particular variety of «Scythian» he encountered was called the Parthian. It is possible that in the Parthians a Mongolian (Turanian) element was now mingled with the Aryan strain; but the campaign of Crassus beyond the Euphrates is curiously like the campaign of Darius beyond the Danube; there is the same heavy thrusting of an infantry force against elusive light horsemen. But Crassus was less quick than Darius to realize the need of withdrawal and the Parthians were better bowmen than the Scythians Darius met. They seem to have had some sort of noisy projectile of unusual strength and force, something different from an ordinary arrow. The campaign culminated in that two days’ massacre of the hot, thirsty, hungry, and weary Roman legions which is known as the battle of Carrhae (53 B.C.). They toiled through the sand, charging an enemy who always evaded their charge and rode round them and shot them to pieces. Twenty thousand of them were killed, and ten thousand marched on eastward as prisoners into slavery in Iran. 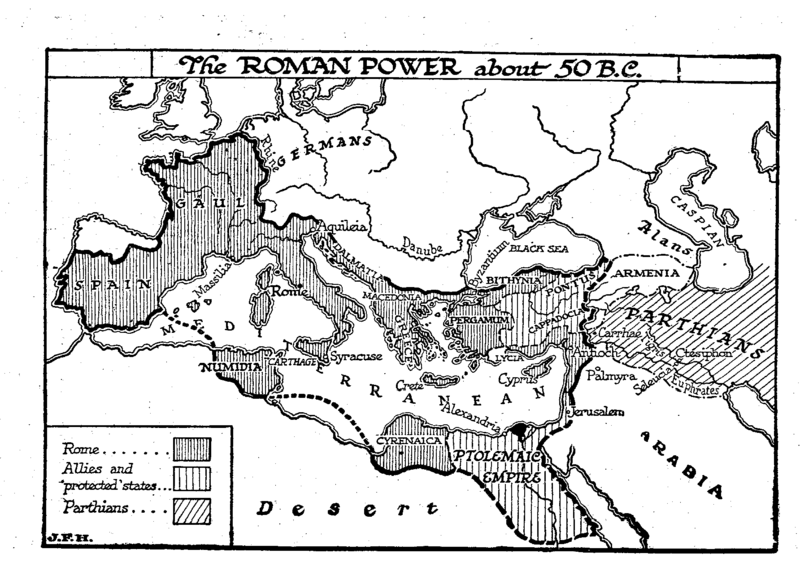 Figure 438: Map — Roman Power, 50 B.C. What became of Crassus is not clearly known. There is a story, probably invented for our moral benefit and suggested by his usuries, that he fell alive into the hands of the Parthians and was killed by having molten gold poured down his throat. But this disaster has a very great significance indeed to our general history of mankind. It serves to remind us that from the Rhine to the Euphrates, all along to the north of the Alps and Danube and Black Sea, stretched one continuous cloud of nomadic and semi-nomadic peoples, whom the statecraft of imperial Rome was never able to pacify and civilize, nor her military science subdue. We have already called attention to a map showing how the Second Babylonian Empire, the Chaldean Empire, lay like a lamb in the embrace of the Median power. In exactly the same way the Roman Empire lay like a lamb in the embrace of this great crescent of outer barbarians. Not only was Rome never able to thrust back or assimilate that super incumbent crescent, but she was never able to organize the Mediterranean Sea into a secure and orderly system of communication between one part of her empire and another. Quite unknown as yet to Rome, the Mongolian tribes from North-eastern Asia, the Huns and their kin, walled back and driven out from China by the Tsi and Han dynasties, were drifting and pressing westward, mixing with the Parthians, the Scythians, the Teutons and the like, or driving them before them. Never at any time did the Romans succeed in pushing their empire beyond Mesopotamia, and upon Mesopotamia their hold was never very secure. Before the close of the republic that power of assimilation which had been the secret of their success was giving way to «patriotic» exclusiveness and «patriotic» greed. Rome plundered and destroyed Asia Minor and Babylonia, which were the necessary basis for an eastward extension to India, just as she had destroyed and looted Carthage and so had no foothold for extension into Africa, and just as she had destroyed Corinth and so cut herself off from an easy way into the heart of Greece. Western European writers, impressed by the fact that later on Rome Romanized and civilized Gaul and South Britain and restored the scene of her earlier devastations in Spain to prosperity, are apt to ignore that over far greater areas to the south and east her influence was to weaken and so restore to barbarism the far wider conquests of Hellenic civilization. The bow was probably the composite bow, so-called because it is made of several plates (five or so) of horn, like the springs of a carriage: it discharges a high-speed arrow with a twang. This was the bow the Mongols used. This short composite bow (it was not a long bow) was quite old in human experience. It was the bow of Odysseus; the Assyrians had it in a modified form. It went out in Greece, but it survived as the Mongol bow. It was quite short, very stiff to pull, with a flat trajectory, a remarkable range, and a great noise (cp. Homer’s reference to the twang of the bow). It went out in the Mediterranean because the climate was not good for it, and because there were insufficient animals to supply the horn. —J. L. M.